Many of Jacksonville’s residents come from somewhere else. Perhaps they relocated here because of a job, or are navy transplants, or married a native Jacksonvillian, or found themselves here in search of a better life for their families. As I suggested in my previous post, a major factor contributing to Jacksonville’s unique culinary culture is this incredibly diverse makeup of our population. And there’s no better way to explore this diversity than to embark on a culinary tour of the ethnic food markets of Beach Boulevard. 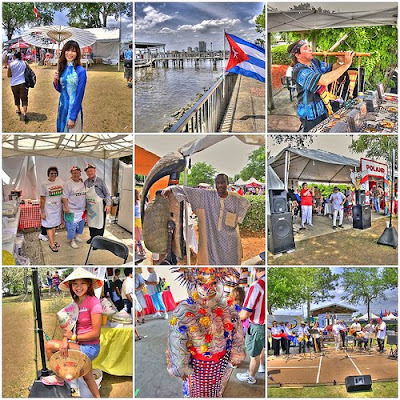 On one single street (granted, it’s a loooong street) you’ll find shops and restaurants representing Jacksonville’s Korean, Japanese, Thai, Indian, Pakistani, Latin American, and Eastern European residents. Join me as travel the world without leaving Jacksonville city limits! 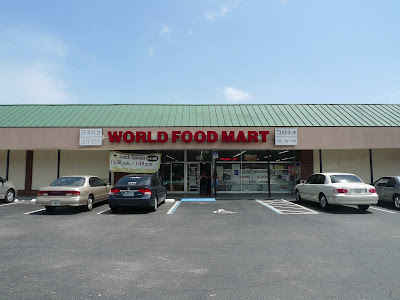 World Food Mart is an Asian and Latino grocer in a strip mall on Beach Boulevard, close to where the bouley intersects with the Hart Expressway. 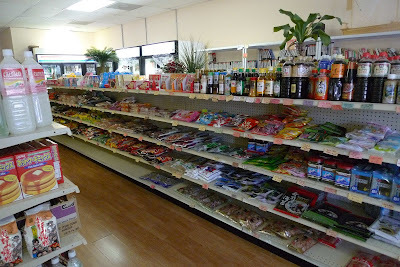 Jacksonville has a lot of grocery stores selling Asian food products. What makes World Food Mart stand out from the Asian grocer pack is the food corner tucked away to the side of the market - walk in, turn left, pass the veggies (don't forget to admire the massive $1.99 knobs of ginger! ), and there it is - a little eatery! 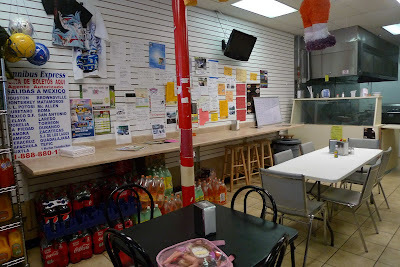 Your seating options are a couple of tables and a long counter, behind which is a friendly lady or two pulling together noodle soups and various Korean and Japanese specialties. 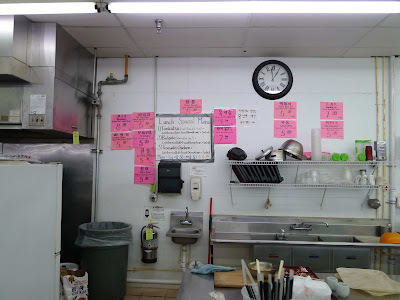 The menu items are posted on sheets of pink paper on the wall behind the counter where you order. Everything is written in Korean with an English translation below. Good thing – the lady working the counter when I visited spoke limited English. Prices are listed under the descriptions of the dishes; you’re looking at $5.99 for jab chae (described as noodle and veg stir fry), gom tang (beef meat and bone soup), or bi bim bab (rice with vegetable and sweet and spicy sauce). Yeah. $5.99. There's also a more extensive English menu perched in a plastic case by the cash register. It’s double-sided, so don't forget to turn it over. $5.99 might sound like a steal, but the $4.95 lunch specials are even lighter on the wallet. They’re also posted on the wall, on a big white poster board. $4.95 for tonkatsu (fried breaded cutlet), bulgogi (marinated beef), or teriyaki chicken accompanied by fried dumplings, cabbage salad, kimchi, and rice. Unbelievable! My girlfriend ordered the bulgogi lunch special. The cook makes everything to order, so it’s not the quickest meal in the world. But for these prices, who the heck cares. I saw a few folks put in their food order then spend fifteen or so minutes poking around the rest of the market. The bulgogi wasn’t grilled, which is the more traditional method of preparation. Instead the meat was stir-fried with onions, carrots, and scallions. 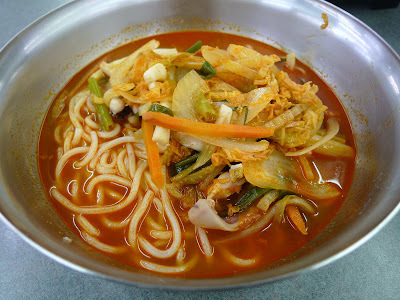 Friends had told me I absolutely must try the spicy seafood udon soup with squid, octopus, and vegetables. The menu calls it "spicy seafood noodles" and when I ordered it, the lady scrutinized me for a second before offering her advice: "HOT." She was implying it would be too spicy for my uninitiated palate. It definitely wasn't, but I really dig spicy food, so beware if you're sensitive. There certainly was a good amount of chili oil in the broth which lent the soup an intense reddish orange hue. The udon noodles were thick, fat, and slippery. There was a lot of cabbage floating around in there, along with a handful of onions and carrots and scallions. The seafood sunk to the bottom so I had to fish for the squid and octopus. This was a filling soup that was the perfect portion size for lunch. Not the best bulgogi or udon I’ve ever had, but a cheap and unique ethnic dining option for Jax. You'll obviously find lots of Asian products in the grocery part of the store. There are aisles of dry goods, a freezer section along the back wall, and a fridge section to the right. Next to the food corner kitchen is a fridge display full of many different kinds of house-made kimchi, including familiar varieties made with cabbage and daikon. There’s also a great selection of pickled little fishies and anchovies, but I don’t know how on earth I’d ever use up a whole pint of those. Near the food corner is an aisle dedicated to kitchen and dining products, like rice cookers and cheap chopsticks and tea sets and suribachi (Japanese mortar and pestle with a ribbed interior that makes grinding sesame seeds easy work). My rice paddle broke awhile back so I picked up a new one for under $5. I had a conversation with Jodi over at Eat Jax about where to find pork belly in Jacksonville. It’s certainly difficult to source here, but you can get it at World Food Mart, in the freezer section. You’ll also find a large selection of seafood, dumplings, dumpling wrappers, lumpia, and thinly sliced beef and pork for use in a dish such as shabu-shabu. I was happy to find a number of different varieties of miso paste in the refrigerator section. One word of note: the prices of the dry goods, fridge and freezer items, and kitchen and dining gear are higher at World Food Mart than what I've come to expect from Asian markets in larger cities. But there are some great deals to be found in the produce section near the front of the shop. As far as Asia is concerned, you'll also find a beauty supply section and a ton of movies, both dubbed and foreign. And a sizeable music collection, mostly of burned CDs. The Latino food selection is disappointing - you'd do better to head to one of the many dedicated Latino food vendors a little further up Beach (Mi Pueblo comes to mind – see below). I’m a bit confused as to why World Food Mart even carries Latino products at all. It’s definitely not the market’s specialty. There are, however, a lot of Latino spices available. What do you use avocado leaves for, I wonder? Or corn silk? A ways further down Beach Boulevard – towards the beach – is a strip mall that is home to five, count ‘em FIVE, notable ethnic eateries and shops: Mi Pueblo Bakery, Mi Pueblo Meat Market, Apna Bazaar, Apna Restaurant, and Sala Thai Restaurant. I have yet to dine at the restaurants but have had the pleasure of shopping at the markets and lingering over a coffee and a few pastries at Mi Pueblo Bakery. 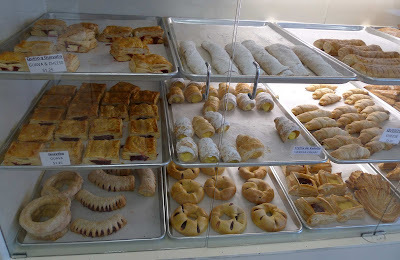 Mi Pueblo Bakery offers a dazzling array of Latino baked goods in a big, bright, spotlessly-clean café-style space. Two of the walls have floor-to-ceiling display cases abounding with desserts, pastries, and breads. Each item is labeled with its name in Spanish and an English description. A younger guy working in the bakery greeted us the moment we walked in and gave us an overview of all of their baked goods. He said his favorite pastry is a flaky croissant-like concoction called a “quesito” that’s filled with tangy fresh cheese. He gave us each one to try - for free! We picked out a similar layered confection that was filled with guava and cheese and ordered two coffees at the counter. I thought Mi Pueblo Bakery couldn't get any better. And then I tasted the coffee. It’s exactly like the coffee my Puerto Rican grandfather makes – basically the creamiest, frothiest café con leche ever. Made me very nostalgic. When I told my grandmother about Mi Pueblo, she said my grandfather had guava and cheese pastries with coffee and a newspaper for breakfast every morning while living in Puerto Rico. 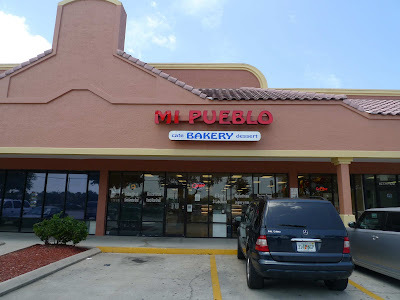 Mi Pueblo Bakery is as authentic as they come. The bakery also has some savory prepared foods for sale. They're displayed in a heated case by the cash register. Empanadas colombianas, stuffed arepas, stuffed potato balls, pastelillos (savory filled flaky pastries). 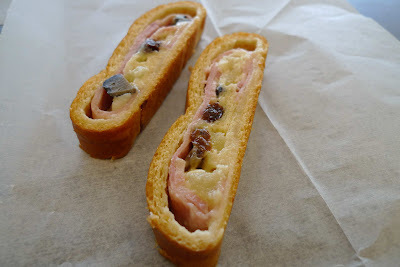 Our new friend gave us another free sample when we paid - a roulade stuffed with cheese, ham, raisins, and black olives. There’s no shortage of inspiration in this strip mall on Beach. Just a few doors down from the bakery is Mi Pueblo Meat Market, a Latino grocery store/ meat market that’s packed floor to ceiling with every imaginable Latino meat, cheese, sausage, sweet, sauce, chile, or dry good. What makes this grocer stand out in my mind is the excellent fresh meat counter at the back of the store. It’s manned by butchers who are happy to speak with you about the items on offer and honor any special requests – a rarity in today’s world of supermarketed, pre-butchered, plastic-wrapped meats. I noticed meats that you won’t find in Publix: oxtails and tripe and pork picnic roasts and beef tongue. In the fridge section off to the right of the meat counter you'll find fresh cheeses, melting cheeses, salty cheeses, and soft cheeses, as well as different kinds of chorizo and other sausages. There's a small selection of vegetables in the fridge section, but that's not really the specialty of Mi Pueblo. Although there was a bin of jalapenos and a pile of green and black plantains near the back of the store. Know what else is awesome about Mi Pueblo Meat Market? There’s a tiny eatery serving Mexican specialties set up in the back corner of the market. The kitchen is small, as is the dining area, so you might want to grab your meal to go and spread it out on your own dining table at home. 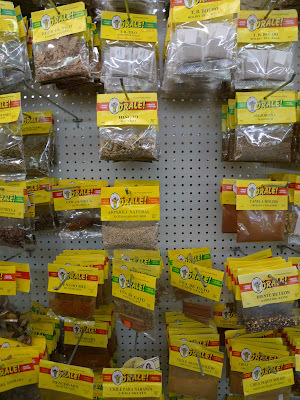 Just next door to Mi Pueblo Meat Market is Apna Bazaar, an Indian/ Pakistani grocer that carries just about every Indian dried good you'll ever need. Ten pound bags of many different brands of basmati rice, a mind-blowing selection of spices, a billion different types of flour, and dry mixes for breads and soups and dosa and, well, you get the idea. Apna Bazaar also has one of the best selections of Patak's curry pastes and chutneys that I've seen in the U.S. (Patak’s is the preferred brand of my Australian-Indian friend Jackie Singh and her mom. Jackie’s one of the best cooks I’ve ever known, so I certainly trust her recommendation). Apna Bazaar has fridges and freezers lining two of the walls. It's here you'll find frozen Indian dinners, many different types of frozen Indian breads like paratha and roti and chapati, paneer, and bags of frozen vegetables. One of the fridges carries an array of Indian sweets like gulab jamun and a variety of different pastries. 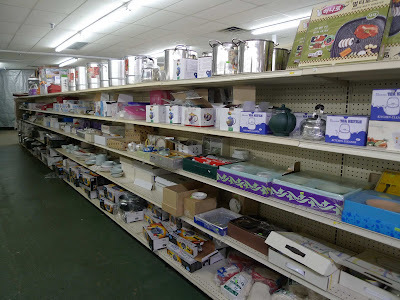 You can also get cooking gear at Apna Bazaar. The grocery has tava (Indian/ Pakistani griddles) at a few different price points, as well as thali sets. I think the fresh meat counter differentiates Apna Bazaar from its peers. 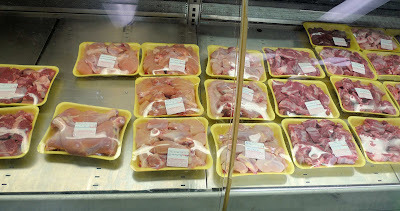 All of the Indian chicken dishes I've cooked at home call for skinless meat, so I was happy to see a variety of skinless chicken parts available here. Will help me cut down on prep time and eliminate that slimy bag of chicken fat and skin in my freezer (don’t ask). 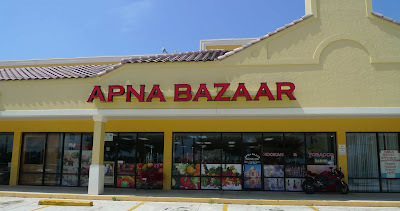 I also like that Apna Bazaar had a box full of fresh Indian breads near the cash register and that everyone, from the storekeeper behind the cash register to the folks stocking the shelves, had a smile for me and my friend. 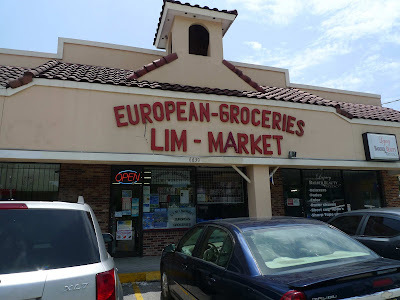 Lim Market is a teensy European grocer a little further down Beach Boulevard. I can't believe how many goodies they manage to pack into this little space! 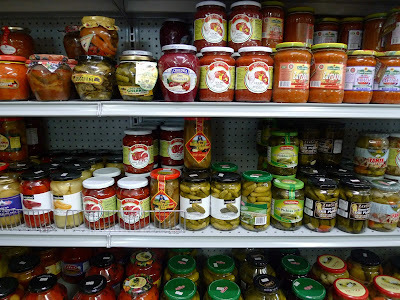 Most of the items I recognized hailed from Eastern Europe or Germany. The shopkeeper and all of the many patrons who filtered in and out while my friend and I were shopping spoke a language I didn't recognize, so it's clear that Lim Market is serving an ethnic population in the area. But you won't feel unwelcome here - everyone greeted us with a smile. When you first walk in, there's a freezer to your left that holds cheese-filled borek, pierogi, and other frozen foods. Near the back of the store you'll find more freezer space and a big fridge. What’s inside? A billion different varieties of sausages (cevapcici, anyone?) and lots of yogurts and fresh cheeses and Alpine butter and fresh rolled cakes filled with fruit jams and phyllo and baklava... and on and on and on. Circle Japan is a Japanese grocery and café set back in the corner of, you guessed it, a strip mall. There are a couple bistro tables set up on a little shady outdoor patio with flower boxes all around, and a chalkboard set outside advertising fresh bread and homemade coffee. Because Circle Japan is located at the very end of the strip mall, this outside area is bordered on one side by trees, making it an unexpected little enclave on Beach Boulevard. When I visited recently, I was immediately greeted by a smiling lady who was hanging out at the coffee bar at the back of the store. There were a few other women hanging out back there, and they happily chatted in Japanese while I browsed around. Circle Japan is very clean and bright, and the items are all well-presented and well-organized. Exactly like the grocery stores I remember from Japan. Also like Japan, there's not much English so you depend on cute little cartoonish drawings or photos to inform you of the contents of the packages. Many of the items are accompanied by written descriptions in English, but not all. In the center aisles of the shop, you’ll find noodles, soy sauces, mixes, packets, spices, sushi fixin's, Pocky, panko, candy... lots of Japanese stuff. There are DVDs in Japanese, too, and some magazines. 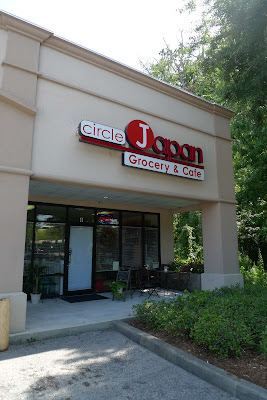 I love that they strictly focus on Japanese goods instead of mixing together a mishmash of Asian cuisines and ingredients like other Asian markets in Jacksonville. There's a small fridge and freezer section in the back right corner of the shop. I noticed different types of miso, green tea ice cream, mochi ice cream, dumpling wrappers, gyoza, and some frozen fish. 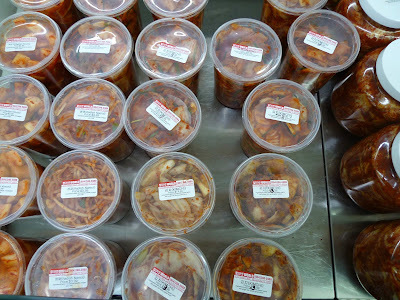 A variety of house-made kimchi at World Food Market? Oooooo I'm so going there to try them out! I love kimchi!! Let me know if it's good - there was a guy making it right there, so I know it's fresh and made in-house! Their kimchi gets good marks. Order some chow there and you can sample it. 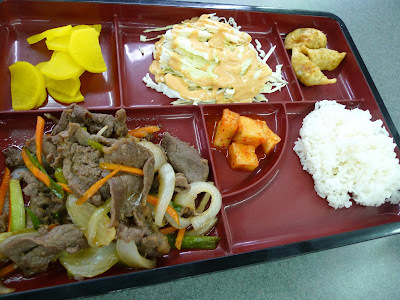 As with the prepared meals, the kimchi price is reasonable. What a fantastic town Jacksonvill is! It has a wide variety of food markets. Is that why you chose the place to live in there? The names of the markets are very funny! Circle Japan??? Circle K is one of the famous convinience stores in Japan. I want to visit your town to see them. I hope you can visit me here someday! I was thinking of Circle K when I visited Circle Japan - wonder if they had that in mind when they opened this little shop?! Sadly there are no good Japanese restaurants in Jacksonville (except for a few notable sushi joints)... but I will keep looking! FYI, you can buy oxtails at Publix and Sams Club, and you have to ask the Publix butcher for beef tongue (my mom had to buy it for lengua estofada). Thanks for the tip, Maria! I'd seen oxtails at Publix & Winn-Dixie, but not on a regular basis... and didn't know you could ask for beef tongue! Hope people support Mi Pueblo over the big groceries if they can easily get there!! I will most definitely go to Mi Pueblo! I think I had their pastries at a Hispanic Bar meeting once and was demanding where they got their pastries (empanadas and pastelitos, I think). I believe Publix will also sell you the beef tripe if you ask - you just may have to call ahead. I drive past these places every day on my way in to work - Mi Pueblo is amazing - I have yet to get to World Food Market but I will definitely make a point of it soon - thanks for the guided tour! World food mart is definitely the place for Korean ingredients. 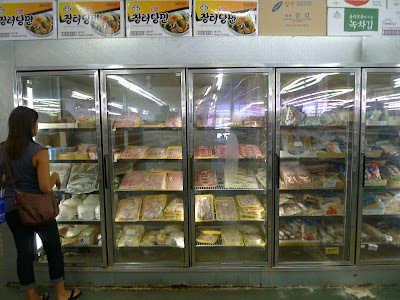 We buy pork belly and the cabbage kimchi for jae yook bokum, which my hubs likes a lot. He's 1/2 Japanese so we pretty much know all of the East Asian markets around these parts. We had fun in Circle Japan - the staff are super friendly. I think I have been in the market at Mi Pueblo (I remember being highly impressed by the butcher counter) but we somehow missed the bakery. Must try it soon! And you are right about the lack of Japanese restaurants in Jax (excluding a few great sushi bars) but we found Hanamizuki in Orlando last weekend and plan to return. Check it out next time you are down that way. 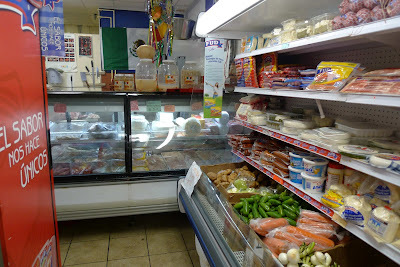 @erosazul Mi Pueblo Bakery is relatively new so perhaps it wasn't around when you visited the grocery? Definitely check it out, it's well worth it! Thank you so much for that information. i've passed these places many times, but never thought about going in. Now that I know what goodies they contain, I will be making a visit to them.